RatingView lets you display an average rating and, optionally, collect a user's rating submission on items in your Xamarin.iOS application. You can use whatever images you want and whatever scale size you need. 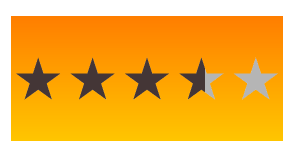 Many people use five stars. Others have something else entirely. Perhaps you want a 10-tomato rating. Whatever you need, you give it a rectangle to fit into and it will resize things accordingly. Ratings displays are kept minimal. If you need to compose your ratings view into something else, it will overlay it just fine. In any code-based UIView or UIViewController, you can add a PDRatingView to the displayed just like any other view. // Gather up the images to be used. // [Optional] Do something when the user selects a rating. Need some space between your rating items? Just set the ItemPadding in the RatingConfig object used to build the PDRatingView. // Put a little space between the rating items. If you are showing a rating without any intention of collecting a rating from the user, you can keep the rating view from taking any user input with the default iOS setting. As a result, this will keep it from ever triggering a RatingChosen event. // Only display the rating; don't allow user rating. Say you need users to rate things on a scale to ten. That can be changed in the RatingConfig object used to build the PDRatingView. The default is a 5-item scale of ratings. // Allow rating on a scale of 1 to 10. If you want average ratings to display in half- or whole-star increments, that isn't currently built in to the PDRatingView system directly, but you can very easily use .NET to round appropriately before setting the view's AverageRating to reproduce the same result. v2.0.2: Corrected namespace (breaking, but nothing internal changed). v2.0.1: Updated component and samples to support Xamarin.iOS Unified API (again, after breaking changes in the latest Unified API release). v2.0.0: Updated component and samples to support Xamarin.iOS Unified API.